Central California Soaring Association: August 10, a bit cooler and very good soaring. Comment: Great Day, busy schedule! Morgan, Pancho, Katie and I (Julie) arrived at Avenal with operations already in order. Dan Gudgel was completing a tow pilot check out for Russ with Keith and Joe (both from Shell Beach) receiving some early morning training flights. After rigging my glider, I jumped in the tow plane and did one tow off 13 before switching operations to 31 for the remainder of the day. Jack Knutson brought out a new member, Tim, for a glider lesson with Alex; Andrea Mersino brought out a friend to take up; Yutaka Buto brought out a friend as well. Pancho went aloft in the 1-26 and Andy and Morgan in their fiber glass ships. Once the afternoon group was aloft, I talked Alex into giving me a tow. Pancho ready for a long flight in the 1-26. The tow plane was already put away, but I convinced him that we needed to fly it again anyway to get the engine warm for the oil change. So up he went in JB for a short flight to get acquainted with the wonderful world of slippery ships. He had a beautiful landing and is now hopefully motivated to proceed faster with the partnership in a Libelle with Jerry Badal. With the Duo still in Cal City and the convergence looking like a good one according to the RASP, we decided on Avenal for the day. Karl was out of town and Harold down with a knee issue so I had GD to myself. It looked good for a run to the south and another attempt at Diamond Goal. In the morning I ran around handing out A/B/C badge cards to people. Dan and Alex confirmed requirements and signed off for those that filled out their cards. We now have a number of "Official Observer" qualified members. I had Julie observe that the 302 was installed in the glider and that I wasn't able to cheat and modify it. Julie then towed me and I got off in a nice thermal after a pattern tow. Pancho was high overhead at nearly 5k. I couldn't get above 3. I joined Andy for a few turns half way to the mountains and then pushed deeper finding good lift to get onto the shoulder of Black. Southerly flow had the south face working to over 7k and with that I headed south in the blue towards the first Cu at the north end of CA Valley. Not the only cu, but hard to spot in the haze. The blue was working well. Very smokey/hazy day and the convergence was pushing up haze domes marking the tops of thermals even where there weren't actual clouds. The Cu that did pop were thin and short cycled, but it was an easy run south with only a couple of stops to climb required. I was trying to tag Conover up in Lockwood Valley near Mt. Pinos. It was in the blue and the convergence line dipped way to the south of New Cuyama, nearly to Ojai. There were a few small cu that were cycling near Pinos and I decided to try a max glide from around 10k to get on the shoulder of Pinos and find a climb. It didn't work. Probably 1500 agl and still several miles east of the New Cuyama airport trying to get back to those clouds. I turned with 1000ft over a pattern at New Cuyama and try to find a climb along the foothills on the south side of the valley. Nothing but strong sink and an inability to find the thermal near it. Finally, a few miles east of the airport I picked up a climb at about 1300agl. 500ft in that gave me the confidence to press farther west towards the clouds and the convergence. I was rewarded with 5+ knots to 8000. I ran the convergence north for 15 miles and then took one more climb. That was the last circle I made for 1:50minutes. The convergence was consistent enough that I was able to flying between 6700-9700 from near New Cuyama to about 10 miles South of Panoche before turning and running back to Avenal. It was a 269km "final glide" or 167 miles if that rings true. I think that's my longest run out of Avenal without circling. It's amazing what you can do in an efficient ship and by making good decisions on what line to take. Haze in the blue. No clouds for most of CA Valley, still good lift. Line north near EL5 and San Benito Mtn. Running up the San Benito range. Hernandez reservoir just visible on the left. Cloudbase getting lower as I approached more marine influence near Hollister. Good clouds across New Idria Valley and even beyond Panoche. 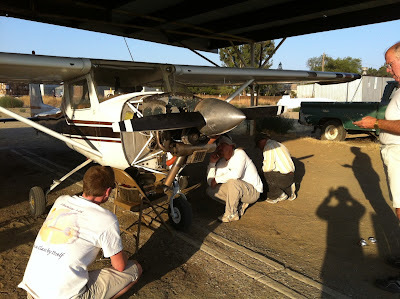 Last item of the day was changing the oil on the tow plane. When Jim offered his assistance, I of course happily accepted. It only took four of us and three phone calls to get it done, but the plane is ready to go for another busy weekend. Aha! The problem is the interpolation flange on its orthogonal interconnect to the flux capacitor. Alex casually warms up the engine, arm out the window like on a country joy ride. Russ departs after a morning of towing and training.